I am pretty terrible at cooking. I can cook, but it doesn't always turn out to plan... which doesn't say much for the cooking school I went to for two years. I did this course cooking course way back when I was sixteen, it was some pilot scheme my school was doing, and they sent you to a local university every friday and cooked. 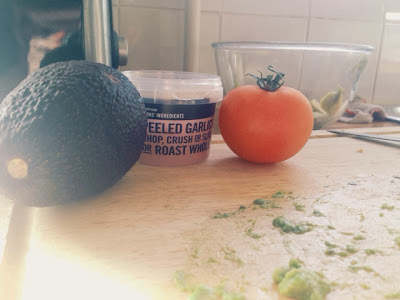 It wasn't as interesting as it sounds, and the only things I really learnt was how to smoosh up Garlic, and to not get baking powder and flour mixed up. That was an awful experience. So now you know about my terrible cooking skills, lets proceed in the lesson at hand! Today, I am going to teach you how to make Guacamole. It's one of my favourite things ever, and it's green so that means it's healthy! What you will need: 2 Avocados, 1 Giant tomato, Garlic Cloves, and an Onion that looked sad which is why it isn't in the photo. You can add some peppers too if you want it to be spicy, but this recipe isn't for spicy Guacamole. Spicy stuff makes my taste buds sad. Garlic doesn't grow in pots, mine is only in a pot because it was cheaper to buy a pot of Garlic cloves than a pack of Garlic. 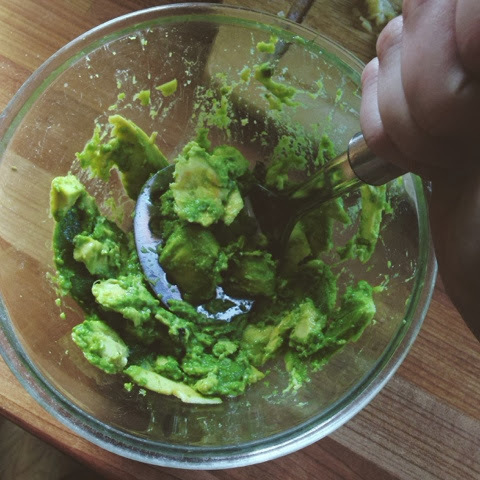 First you chop up the avocado, and peel the skin off of it. It's pretty easy to pull it off once you've cut it in half, but you have to be careful with the massive seed/stone inside, you need to literally cut around it. You then peel, chop and dice your remaining ingredients. I only used 2/3 of the tomato and half of the onion, but you feel free to use as much or as little as you want. I am a massive garlic lover, so I used 4 of the little cloves to make sure it was extra garlicy! NOM. 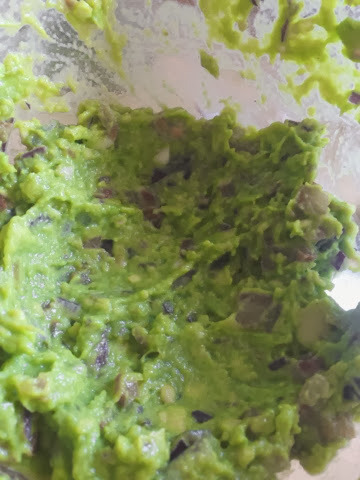 You then push all of this to one side, throw your chopped avocado into a bowl and start smooshing until it looks like a guacamole type paste. You can use a variety of things to mash it up, here are some examples: A potato masher, a rolling pin, a shoe, a fist, a saucepan, a dog, a cat, a dog and a cat or even a dinosaur. 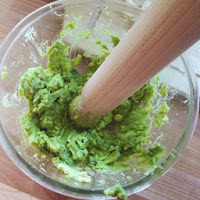 Once you've done the smooshing, pick up all your chopped stuff, throw it in, and then give it a mix. Make sure you taste it every now and then, and add more garlic/tomato/onion accordingly. If you're feeling fancy, you can squeeze some lime juice into the mixture, just to make it a bit more sweet/sour/something... It does something. 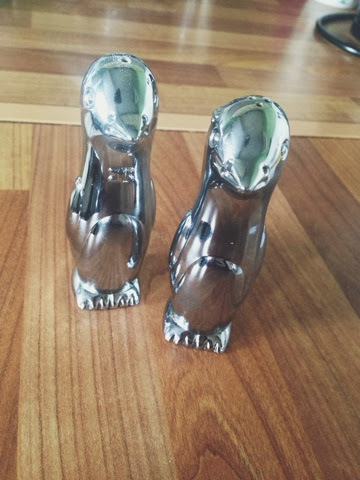 You then use use super cute penguin salt & pepper shaker shakers your auntie gave you at Christmas to season, and then BOOM! You have some Guac! Leave it in the fridge for a few hours to let all the flavours congeal together and all that before you use it! Let me know how it turns out, I'm interested to see if other people like my recipe for guac as much as I do!